For some people, surgery may not be an appropriate or desirable option. There are only two certified treatments for hair loss that are certified by the FDA (Food and Drug Association in America); Rogaine and Propecia. 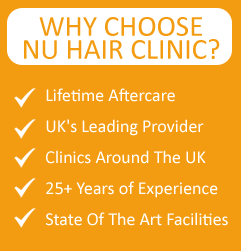 Both of these are offered by Nu Hair Clinic. The foam should be applied twice a day and results will begin to show in as little as 4 months.hairs to grow back. Propecia also known as finasteride reduces hair loss and improves new hair growth by blocking DHT, a key factor in the hair loss cycle. In clinical trails, 90% of men had visible results; two thirds of these men saw new hair regrowth with one third had a reduction in hair loss. Propecia is a once a day tablet that is ideal for men who have lost hair on the top or back of the head. Results normally begin to show after 3 months but can take up to a year.